Connor Thomas Barth (born April 11, 1986) is an American football placekicker for the Chicago Bears of the National Football League (NFL). He played college football at North Carolina and was signed by the Kansas City Chiefs as an undrafted free agent in 2008. Barth has also been a member of the Miami Dolphins, Denver Broncos, Tampa Bay Buccaneers, and the New Orleans Saints. He currently holds the highest field goal percentage in Buccaneers franchise history, a record he achieved during the 2011 season. He also broke another franchise record during the 2012 season in which he made 25 consecutive field goals. He is also the most accurate kicker in Buccaneers history, converting 83.8 percent of his field goal attempts (114-of-136) with the club. His 114 field goals, 135 PATs, and 447 points all rank third in franchise history. Barth holds the Buccaneers franchise record for consecutive field goals made with 25. Barth is the son of Thomas and Susan Barth. His younger brother, Casey, was also a placekicker for the North Carolina Tar Heels football team. Conner learned to kick under the tutelage of Brian Cardone in Wilmington, NC. Barth was named to the first-team high school All-America by USA Today during his prep career at John T. Hoggard High School in Wilmington, NC. He played in the U.S. Army All-American Bowl, where he was named the top kicker in the combine. He was selected to the inaugural EA Sports High School All-America Team. Out of high school, Barth was considered one of the best kickers in the country by most recruiting services. He set the North Carolina state record for field goals in a season and career with 38. The Charlotte Observer ranked him among the top 25 overall players in North Carolina. In 2002, he had a string of 40 consecutive extra points. Playing as a punter and a kicker, Barth made 11 of 14 field goals that year. He also was 53 of 54 on extra point attempts as a Junior. He kicked 75 percent of his kickoffs into the end zone. As a punter, he punted 42 times for a 38.2-yard average. As a sophomore, Barth made 11 of 21 field goals. He struggled throughout the season, but connected on eight of his last 10. 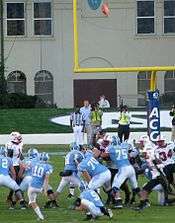 Barth (#10) kicks a field goal in UNC's win over Maryland in 2007. In 2006, as a junior, Barth made all 10 field goal attempts and 24 of 26 extra points. He was the only kicker in the country with a perfect 100% field goal percentage. In a game against North Carolina State, Barth made a 54-yarder that was his career best and tied for the second-longest in school history. In 2007, as a senior, he made 19 of 22 field goals and 30 of his final 33 attempts, dating back to his sophomore season. He earned first-team All-ACC honors from Rivals.com and honorable mention all-conference honors from the Associated Press. Against Miami, Barth kicked a career-high four field goals in the 33-27 win and was named the ACC special teams player of the week. He graduated UNC with a Communications major. Barth was signed as an undrafted free agent by the Kansas City Chiefs in 2008. Barth made his NFL debut on October 26, 2008, against the New York Jets. He failed to beat out Nick Novak for the team's placekicking job and was waived by the Chiefs on August 29, 2008. Barth was re-signed by the team on October 21 after Novak was released, becoming the seventh kicker on the Chiefs roster in two years. In his first NFL game, Barth went 1-for-1 on field goal attempts and 3-for-3 on extra points. He remained perfect up until a week 15 game (going in he was 9 for 9) where he missed 2 field goal attempts, including what would have been a game winning 50 yarder as time expired. Barth was waived by the Chiefs on July 28, 2009, in favor of Ryan Succop. Barth was signed by the Miami Dolphins on August 10, 2009 to compete with incumbent Dan Carpenter. However, the Dolphins waived Barth on August 29. Barth in 2012 while with the Buccaneers. Barth was signed by the Buccaneers on November 3, 2009 after the Bucs released Shane Andrus. Barth tied an NFL record held by three other kickers when he made three field goals of 50 yards or more against the Miami Dolphins on November 15, 2009; the kicks were from 51, 50 and 54 yards. The record is shared with Morten Andersen, Neil Rackers, Kris Brown, and Josh Scobee. On December 27, 2009 Barth kicked a 47-yard overtime field goal to give the Buccaneers the win over the New Orleans Saints, 20-17. On October 10, 2010, Barth kicked a 31-yard field goal with :01 left in the game to give the Buccaneers a 24-21 lead over the Cincinnati Bengals. On October 24, 2010, Barth had a season-long 53-yard field goal vs. St. Louis Rams, while going 4-of-4 on field goal attempts, setting a new career-high for field goals made and tying his career high for attempts. On October 16, 2011, Barth recorded career-high 14 points (4 field goals, 2 PATs) in the 26-20 win against the New Orleans Saints. On December 4, 2011, Barth went 4-for-4 on field goal attempts, converting from 50, 47, 46 and 44 yards, in the first half against the Carolina Panthers. He became just the third NFL player in history to record four-plus field goals of 40 or more yards in one half. Barth the set franchise record with a 92.9 field goal percentage (26-28) in 2011, shattering Steve Christie's 85.2 percent (23-27) in 1990. On October 25, 2012, Barth kicked 3 field goals and 3 PATs for a season-high 12 points in the 36-17 win against the Minnesota Vikings. On November 4, 2012, Barth kicked a career high 6 PATs in the 42-32 win against the Oakland Raiders. At the end of the 2012 season, Barth finished 11th with a career-high 123 points. Barth also set a single-season franchise record with six field goals of 50 or more yards. On July 17, 2013, Barth was placed on injured reserve and missed the 2013 season with an Achilles injury suffered while taking part in a charity basketball game. Barth was replaced by veteran placekicker Rian Lindell. During the 2013 offseason, the Buccaneers signed rookie Patrick Murray to compete with Barth. On August 29, 2014 Barth was released by the Buccaneers, losing to Murray. On November 25, 2014, Barth signed with the Denver Broncos after they released their previous kicker, Brandon McManus. During his five games in 2014, Barth tied the Broncos record of five field goals in a game twice. On August 26, 2015, Barth was released. Barth signed a two-year contract with the Tampa Bay Buccaneers on August 26, 2015. On September 4, 2015, he was released by the Buccaneers. He was resigned by Tampa Bay on October 6, 2015 after the team released starting kicker Kyle Brindza. On November 8, 2015, Barth kicked a season-high 4 field goals against the New York Giants. On May 2, 2016, Barth was released after the Bucs drafted star college kicker Roberto Aguayo in the second round of the 2016 NFL Draft. On May 19, 2016, it was reported that Barth was on his way to New Orleans to sign with the Saints, where he would compete with the Saints' current kicker Kai Forbath. On September 3, he was released by the Saints after getting beaten out by Forbath. On September 5, 2016, Barth was signed by the Chicago Bears to replace Robbie Gould. On September 18, 2016, Barth missed his first field goal attempt with the Bears against the Philadelphia Eagles. ↑ "Tampa Bay Buccaneers Career Kicking & Punting Leaders | Pro-Football-Reference.com". Pro-Football-Reference.com. Retrieved 2016-05-02. 1 2 3 4 "Tampa Bay Buccaneers: Connor Barth". www.buccaneers.com. Retrieved 2016-02-03. 1 2 3 4 5 6 7 8 9 10 University of North Carolina Tar Heels Official Athletic Site Archived May 18, 2008, at the Wayback Machine. ↑ University of North Carolina Tar Heels Official Athletic Site Archived December 28, 2007, at the Wayback Machine. ↑ "Chiefs vs. Jets - Box Score - October 26, 2008 - ESPN". ESPN.com. Retrieved 2016-02-04. ↑ "Dolphins Trying To Kick Starter Dan Carpenter". Sun Sentinel. ↑ "Buccaneers vs. Saints - Game Recap - December 27, 2009 - ESPN". ESPN.com. Retrieved 2016-02-04. ↑ "Buccaneers vs. Bengals - Game Recap - October 10, 2010 - ESPN". ESPN.com. Retrieved 2016-02-04. ↑ "Rams vs. Buccaneers - Box Score - October 24, 2010 - ESPN". ESPN.com. Retrieved 2016-05-02. ↑ "Connor Barth: Game Logs at NFL.com". www.nfl.com. Retrieved 2016-05-02. ↑ "Saints vs. Buccaneers - Box Score - October 16, 2011 - ESPN". ESPN.com. Retrieved 2016-05-02. ↑ "Panthers vs. Buccaneers - Game Recap - December 4, 2011 - ESPN". ESPN.com. Retrieved 2016-05-02. ↑ "Buccaneers vs. Vikings - Box Score - October 25, 2012 - ESPN". ESPN.com. Retrieved 2016-02-04. ↑ "Connor Barth: Game Logs at NFL.com". www.nfl.com. Retrieved 2016-02-04. ↑ "Connor Barth: Career Stats at NFL.com". www.nfl.com. Retrieved 2016-02-03. ↑ Patra, Kevin (August 29, 2014). "Connor Barth released by Tampa Bay Buccaneers". NFL.com. Retrieved 2014-08-30. ↑ "Broncos waiving Brandon McManus, signing Connor Barth, according to reports". 7NEWS. ↑ Orr, Conor. "Broncos cut Connor Barth; McManus gets kicking job". NFL.com. Retrieved 27 August 2015. ↑ Wesseling, Chris. "Connor Barth, Buccaneers reach two-year deal". NFL.com. Retrieved 27 August 2015. ↑ "Buccaneers boot Connor Barth as teams trim rosters". WWAY TV3. Retrieved 2016-02-03. ↑ "Buccaneers Sign Kicker Connor Barth". www.buccaneers.com. Retrieved 2016-02-03. ↑ "Giants vs. Buccaneers - Box Score - November 8, 2015 - ESPN". ESPN.com. Retrieved 2016-05-02. ↑ "Buccaneers Land 19 Rookie Free Agents". www.buccaneers.com. Retrieved 2016-05-02. ↑ "Bucs cut K Barth after trading up to pick Aguayo". ESPN.com. Retrieved 2016-05-02. ↑ Triplett, Mike (May 19, 2016). "New Orleans to sign ex-Tampa Bay kicker Connor Barth". ESPN.com. Retrieved 2016-05-20. ↑ Katzenstein, Josh. "After cuts, New Orleans Saints have first 53-man roster of 2016". NOLA.com. ↑ Campbell, Rich (2016-09-19). "Connor Barth's first field-goal try for Bears goes awry". Chicago Tribune. Retrieved 2016-09-26. Wikimedia Commons has media related to Connor Barth.